During the 4-day workshop, the students will be assigned to play in an ensemble of duet, trio or quartet. They will be guided throughout by instructors and student mentors. On the last day of the workshop, the ensemble will perform their work at the concert. Other than rehearsing hard, the students will have interaction time with their peers to build circle of friends. It will be a rigorous, yet fun-filled experience for all! 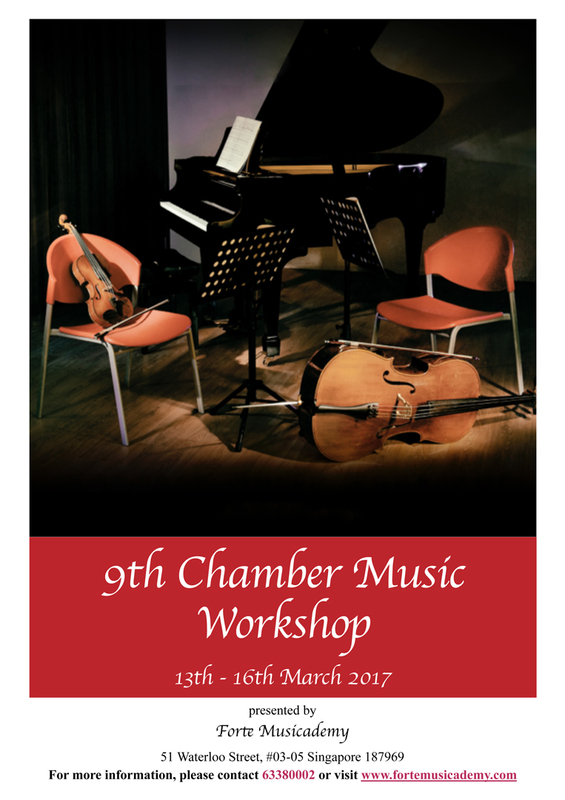 To register please fill up the Registration Form for Chamber Music Workshop 2017 and email it back to us, or fill in a hardcopy and mail it to us. For further enquiries, please do not hesitate to email contact@fortemusicademy.com or call 63380002.